Welcome to Albert! Signing up for an Albert account is as easy as clicking a button. If you haven’t created an account yet, get the app and tap Sign up on the main page. If you're already signed in, then you're ready to get started. Have a look at our stunning invoice template and all the details of it that are fully customisable. If you’re already signed up, then you’re ready to get started. 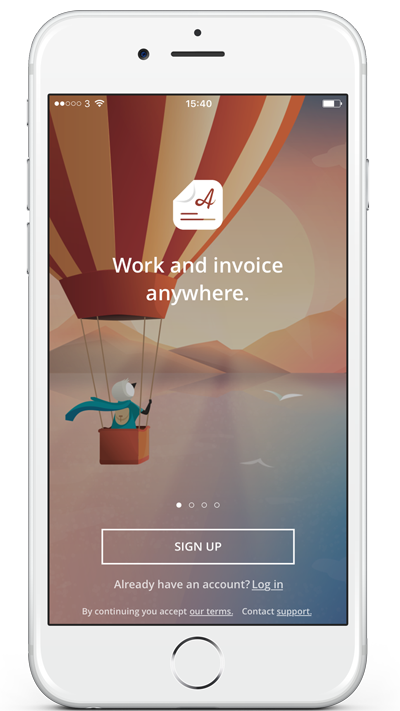 Albert sets up a demo invoice for you, which you can send to yourself, to see what it looks like before sending it to any clients. You can also add your own logo, change the colour of your invoice to match your branding, add a personal message or link to your website or Facebook page.